To observe the expression of P53, CyclinD1, Ki-67, Galectin-3, COX-2, Bcl-2 and approach their contribution on assessing the invasive potential for Hurthle cell tumors. Seventy-three cases of Hurthle cell tumor were collected for immunohistochemistry staining. The patients were followed up with 8 months to 5 years. Tumors were divided into four grades according to invasion and diameter:(1) extremely low risk (27 cases that less than 2 cm and without invasion), (2) low risk (18 cases that within 2–3.9 cm and without invasion), (3) moderate risk (21 cases that achieve 4 cm and without invasion), (4) high risk (7 cases that with invasion of capsule/vessel in spite of the diameter). Immunostaining presented that all 73 cases were positive with Galectin-3, COX-2 and Bcl-2. For each group, P53 positive were 29.6%, 55.6%, 90.5%, 100.0%; CyclinD1 stained with 7.4%,22.2%,52.4%,100.0% and Ki-67 were 0.0%,5.6%,9.5%,28.6%, respectively. 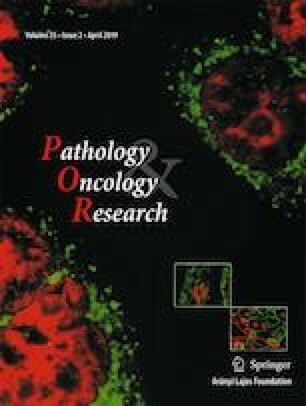 The higher risk of tumor, the more cases that positive expressed P53 and CyclinD1. After following up within 49 patients, two of the recurring cases were positive with P53 and CyclinD1 and one of which was also highly expressed Ki-67. Detecting P53, CyclinD1 and Ki-67 might provide reference for invasive potential assessment with Hurthle cell tumors but not Galectin-3, COX-2 and Bcl-2. Thanks to all the colleagues in our department for their support. Ding Li:design and specimen collecting; Jiang Yunhui:pathology diagnosis and specimen collecting; Yang Wan:operate a immunostaining. Each of the author has approved the final version of the manuscript and reports no conflicts of interest.